The Vision For A Cashless Nation Gets A Big Boost With The Indian Government's "BHIM"
The herculean storm of demonetization has now been covered with a cloak of cashless transactions and digitization which takes a deep plunge into the core of technology and conscience, pushing the nationwide engineers, educators and smart people to speculate over the recent moves by the Indian Govt. 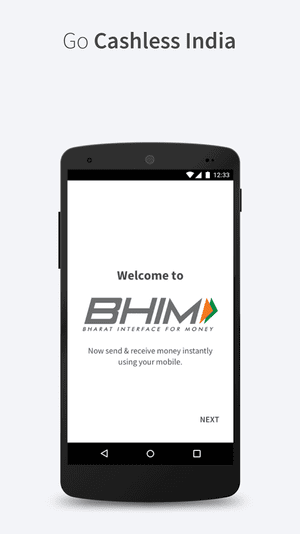 Today, following an announcement from the PM of India, Google Play has just got an entry from the National Payments Corporation of India (NPCI) named BHIM, promising fast, secure, reliable cashless payments through smartphones. It’s an application that should support 31 banks as per the list, given a commitment to access other Unified Payment Interfaces using the interoperable environment. While this is not the first UPI to hit the market, this is definitely one of best methods for paying, as you enter a new year with less cash and more amount in your smartphone. From the look of those advertising screenshots, the payment UI sports a simple layout to help you with your digital payment. After installation, a user needs to register with his bank where a specific UPI PIN for the bank account is set with your mobile number as your payment address. Initially, the application supports three-way transaction through QR code scanning, via the phone number, and through UPI address. Every profile has an individual QR code that is available in profile details section and easily transferable and printable for money transfer. Further, although a default UPI is set on creation of your profile you can edit and fill custom UPI depending on your requirement. The app features an on-the-go balance check option to give you full-fledged details on your transaction. And in total, it is as user-friendly as any other mobile wallet. However, criticism did not spare it as users complain it contains many bugs that diminish its usefulness. Currently, the application is available for download in phones running on Android version 2.3.3 or above.